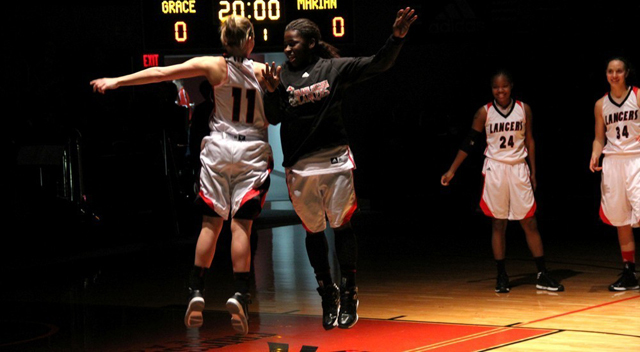 A story posted on the online news site, Stacey Page Online, details a milestone in the life of Grace College women’s roundballer, Allison Kauffman, who scored her 1,000th career point on Wednesday night. It came during a win over Marian College on the Grace campus. A portion of the story appears below. Click here to read the complete story. WINONA LAKE – On a night where Allison Kauffman registered her 1,000th career point, the senior forward scored 20 points to lift the Grace College women’s basketball team to a 78-68 win over Marian on Wednesday. With the win, the Lady Lancers (14-13; 10-5 Crossroads League) secured a top-four finish in the Crossroads League. They will host a first-round game in the CL Tournament for the first time in program history. Additionally, Grace has now tied the 2011-12 Lady Lancers for most league victories in a season.